Let the berries of the season drench these homemade buttermilk thyme biscuits! A truly decadent breakfast choice! In a bowl combine flour, salt, baking powder, baking soda, and sugar and mix until everything is incorporated. Add the fresh thyme to the flour mixture. Then cut cold diced butter into the flour mixture. To do this, add butter to the flour, and with your hands or a pastry blender, combine cold butter into the flour by squeezing the mixture through your fingers. As the butter starts to combine with the flour, the mixture will start to resemble a course cornmeal texture. Once this texture has been achieved, add the buttermilk and combine until a sticky dough forms. Transfer the dough to a floured surface and knead 4 times. It is important that you only need the dough 4 times, because over kneading will cause a tough textured biscuit. Once the dough has been kneaded 4 times, using a rolling pin, roll out the dough into 1 ½ thick sheet. Using a biscuit cutter cut out biscuits and place them on a non-stick baking sheet. Before putting them in the oven, brush with melted butter. Bake for 8 -10 minutes until they have risen and the tops begin to brown. Once they are done remove from the oven and place on a baking rack to cool. In a sauce Pan combine crushed blackberries, peach schnapps, sugar, cinnamon stick, and lemon zest. Cook for about 15 minutes on medium high heat until the jam reduces by a third. Stir occasionally to prevent burning. Once it has reduced, add Balsamic Vinegar and cook for another 2 to 3 minutes and then remove the jam from the heat. Remove cinnamon stick and serve. 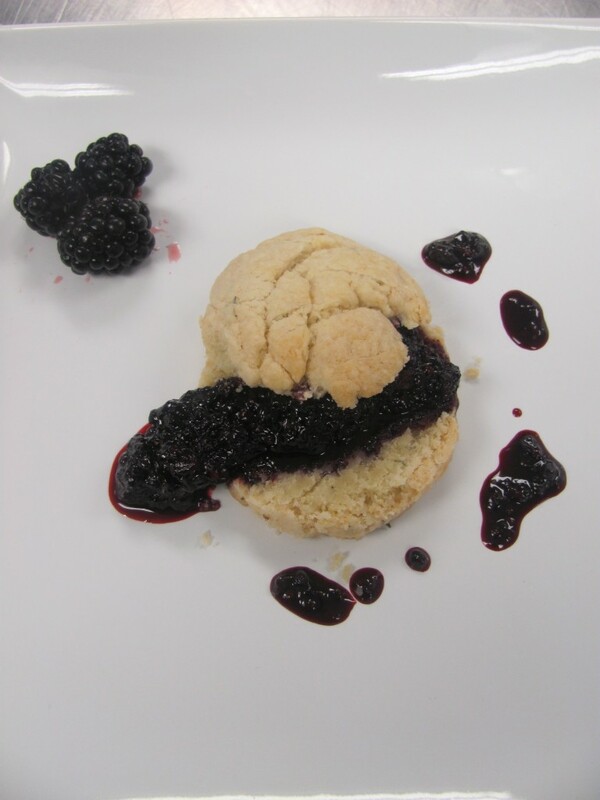 To Serve: Slice a biscuit in half and then spoon on the Balsamic Blackberry Jam. *To crush blackberries, place in a bowl and then use a smaller bowl to crush the blackberries.